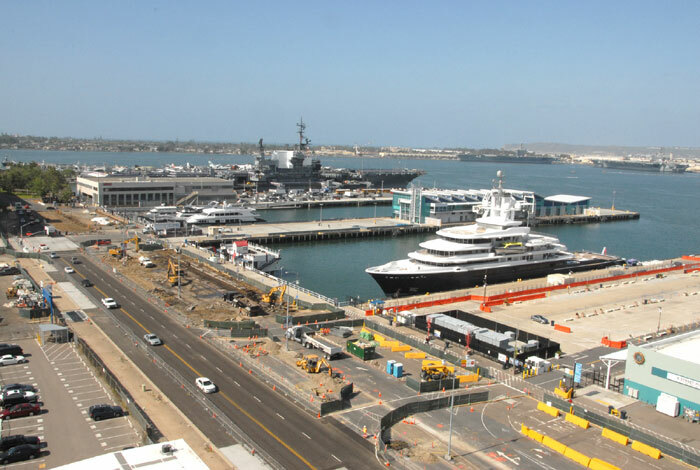 SAN DIEGO — The first phase of the Port of San Diego’s North Embarcadero Visionary Plan is now underway, with work being done on the waterside areas of the north and south sides of the Broadway Pier. The area is currently undergoing demolition to prepare the site for the long-awaited construction of a 105-foot-wide esplanade and two pavilions. A component of the port’s revamped North Embarcadero strip, the esplanade and two pavilions will house new ticket kiosks, a café, visitor information center and a public restroom. Pedestrians are being advised that pavement and other improvements on West Broadway between North Harbor Drive and Pacific Highway are midway through completion and are scheduled to be closed to vehicles until later this month. There is also work being done on West Broadway between Pacific Highway and Kettner Boulevard. If it is determined that the road must be closed, it will not occur until the portion of West Broadway between Pacific Highway and North Harbor Drive is reopened to vehicular traffic, according to the port. Pedestrian access will remain open at all times. This is part of the first phase of the project that began in May as a visionary plan to revitalize the corridor. The first phase of the North Embarcadero Visionary Plan began with the relocation of traffic lanes between Navy and B Street piers. Traffic lanes were moved approximately 60 feet to the east, to better allow for construction of the waterfront promenade. With an expected completion date in 2014, the North Embarcadero area adjacent to Navy Pier, B Street and the B Street Pier will feature a 105-foot-wide public promenade, public gardens, shade pavilions and other amenities, according to the Port of San Diego. The North Embarcadero Visionary Plan Phase I project began construction on Jan. 5, 2012 and will cost $28.6 million. The project is a collaboration among the port, the city of San Diego and Civic San Diego.